Students inside a newly built classroom at a camp for internally displaced persons in Port-au-Prince, Haiti. People of African descent still face racism in every country, region and continent of the world, said United Nations General Assembly President Sam Kutesa as the word body today kicked off its International Decade of People of African Descent. “Over the next ten years, people everywhere are encouraged to take part in the global conversation on the realities faced by people of African descent,” Mr. Kutesa who is a national of Uganda told the General Assembly today, calling the Decade’s launch a historic achievement. “The Decade will allow us to explore the challenges faced by people of African descent due to pervasive racism and racial discrimination engrained in our society today,” he added. Joining Mr. Kutesa at the Headquarters event was UN Under-Secretary-General for Humanitarian Affairs, Valerie Amos, who spoke on behalf of the Secretary-General Ban Ki-moon; UN Assistant Secretary-General for Human Rights Ivan Šimonović; and Irina Bokova, Director General of the UN Educational, Scientific and Culture Organization (UNESCO). The event also featured several performances by African musicians. This Decade is an opportunity for a wide range of actors including the United Nations, Governments, civil society and individuals to create synergy in efforts to combat racism and contribute to the Durban Declaration and Programme of Action (DDPA) adopted at the 2001 World Conference against Racism, Racial Discrimination, Xenophobia and Related Intolerance. Mr. Kutesa added that it is important to ensure the protection of the human rights of all people African descent. Effective actions at the national and regional levels contribute toward tangible improvements in the lives of millions of people of African descent around the world. On the matter of justice, he said that people of African descent are “too often” victims of crime and violence, while facing discrimination in their attempts to seek legal redress. In many societies the problem is endemic. On development, he said the international community has come to recognize the correlation between poverty and racism. Despite the refutable evidence of contribution people of African descent have made to the development of our societies, they are too often marginalized. During the decade, States are encouraged to help people of African descent by revisiting policies and practices that have a negative impact on the communities of people of African descent. African diaspora is a component of Africa, he said. The decade is an opportunity to “unite our voices” and renew political will to eliminate racial discrimination against anyone, anywhere. Speaking on behalf of UN Secretary-General, Ms. Amos said that people of African descent suffer from inequality and disadvantage from the history of slavery. People of African descent are among the poorest and most marginalized around the world with limited access to healthcare, education and even employment. Creative initiatives will be the ones to make concrete impact on people’s lives, the UN chief said, noting that some Member States have already allocated funds for their Decade activities. “Human rights belongs to us all,” he declared, noting recent events in New York that serve as a tragic reminders that people of African descent face disproportionate levels of racial discrimination. But the problem is universal. 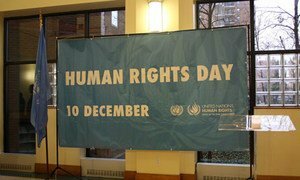 “This Decade aims to shine a light on inequality, invisibility, underdevelopment, discrimination and violence on each and every continent,” the human rights chief said. The 10-year span will be an opportunity to call for the adoption of anti-discrimination laws and ensure justice by fighting against impunity in regard to racial profiling and guarantee the equal protection of the law. Decade activities will also promote the right to development and equal access to education, health, as well as employment. Also joining the event via video conference UNESCO’s Irina Bokova who said the launch of a decade sends at a critical time an essential message of hope, tolerance and human rights. “The Decade is inspired by the powerful idea that to counter discrimination, to build a more just future, we must build on the history all humanity shares,” she said. The past features tragic chapters. The Decade is designed to counter and eliminate prejudices inherited from the past and to shed light on the struggle of people. On the eve of the worldwide commemoration of Human Rights Day, United Nations Deputy Secretary-General, Jan Eliasson, today led in New York’s historic Harlem neighborhood, a public reading of the landmark Universal Declaration of Human Rights.